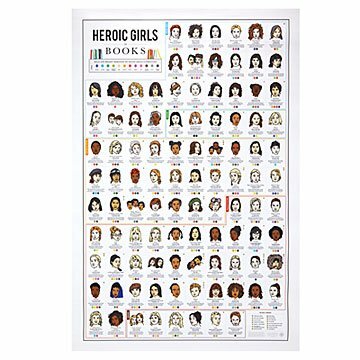 Ignite heroism in a young girl with this poster featuring inspiring characters from young adult novels. One book and one character can show a little girl that she's the hero of her own story. Tim and Aurelia Sanders say, why not inspire girls with 100 characters? The self-proclaimed book nerds-turned-artists created this visual guide to inspire their young daughter. They scoured hundreds of classic and contemporary young adult books and pulled the bold, bright characters that inspired them the most. Think: Poni from Lost Girl Found, and Stella from Stella by Starlight. To capture their stories and illustrations, the couple did extensive research and consulted the children and librarians who knew the characters best. We couldn't be more excited by the result (we're book nerds, too), and think it makes an inspirational gift for young girls everywhere. Made in Seattle, Washington. Great poster but would not have purchased had I realized it didn't come with a way to hang it, given that framing is so expensive. Not sure why UG pictures it that way. I should've read the description better but I thought it came looking like the picture, with the "frame" and string.